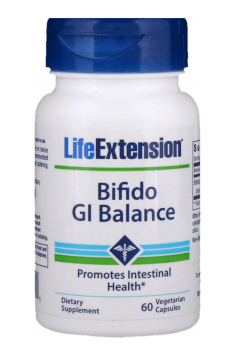 Life Extension Bifido GI Balance is a dietary supplement that includes the proprietary probiotic bacterial strain – Bifidobacterium longum BB536®. Compared to other bifidobacteria, it is distinguished by high stability and durability. It is also one of the best-studied strains in the world, and its pro-health properties have been confirmed in numerous clinical trials. Bifidobacterium is a large group of 12 Gram-positive bacteria that naturally inhabit the human digestive tract. Among them, there are many defined strains with probiotic activity. They play an important role in maintaining the good condition of the digestive tract and may also favorably affect other aspects of health. Unfortunately, this type of probiotic bacteria is very sensitive to changes in temperature and conditions in the gastrointestinal tract. For this reason, the bacteria administered externally, only in a small amount reach the target place, i.e. the intestines. Coming forward to solve these problems, in 1971 Morinaga Milk Industry presented a patented, defined strain, isolated from the group Bifidobacterium, which was named Bifidobacterium longum BB536®. In comparison with other species, it is extremely stable, resistant to temperature fluctuations and able to survive in the acidic environment of the stomach. It easily reaches the intestines and effectively colonizes them, bringing real health benefits. Scientific studies have confirmed that B. longum BB536® favor the stabilization of the intestinal microflora. They easily adhere to the intestinal epithelium and effectively compete with pathogenic microorganisms for access to nutrients. In addition, they show the ability to produce lactic and acetic acid and to synthesize the compounds called bacteriocins. These substances show antibacterial effect – they inhibit the growth of pathogenic microorganisms belonging to such species as Bacillus, Clostridium, Salmonella and enterotoxigenic strains of E. coli. B. longum BB536® works well in persistent diarrhea, bloating and digestive discomfort. It promotes the proper rhythm of bowel movements and relieves pain in the abdomen. In addition, it reduces many symptoms of irritable bowel syndrome and inflammatory bowel diseases, as well as it protects against the development of colon cancer. B. longum BB536® has a positive effect on the lipid profile and may contribute to the lowering in cholesterol levels. The exact mechanism of this action has not been yet known. The researchers suppose that this is related to the biosynthesis of the cholylglycine hydrolase enzyme, and consequently to the increase in biliary acid excretion from the gastrointestinal tract. It is also emphasized that bifidobacteria cells are able to bind cholesterol, which allows lowering the absorption of cholesterol from food. It has been proven that B. longum BB536® are able to stimulate the immune system, which translates into huger immunity and reduced frequency of infection. In tests, it was observed that bacteria of this type promote an increase in the production of immunoglobulin type A (IgA), which is the primary humoral immune mechanism. In addition, they stimulate the expression of neutrophils and NK cells. They also support the balance of Th1 and Th2 immune activity. Stimulation of the immune system by B. longum BB536® bacteria has the additional advantage – protection against allergic diseases. The study of 42 patients suffering from pollinosis showed that people who consumed products enriched with B. longum BB536® reported the relief of the number of allergy symptoms, including disappearance of the feeling of blocked nose, hay fever decreased, redness and conjunctivitis eased. Blood tests confirmed that these were not just subjective feelings, because the markers of allergies also improved. Supplementation with the B. longum strain BB536® is well-suited for people struggling with allergies or intolerance to milk and dairy products. It turns out that B. longum BB536® favor the production of different isoforms of β-galactosidase responsible for the breakdown of lactose. Probiotics are rarely ever associated with the health and strength of the skeleton. Meanwhile, research has proven that, due to their beneficial effect on the intestines, B. longum BB536® promote pH reduction in the bowels, which in turn facilitates the absorption of calcium. The appropriate concentration of this element is crucial for strong bones and healthy teeth. In conclusion, Life Extension Bifido GI Balance is a probiotic whose action goes far beyond promoting the health of the digestive system. In clinical trials, it has been proven that the probiotic bacterial strain contained in the preparation may additionally strengthen immunity and alleviate allergy symptoms. The supplement will also be a good choice for people at risk of hypercholesterolemia or osteoporosis. Bifido GI Balance 60 caps. Take one capsule once or twice daily, with or without food, or as recommended by a healthcare practitioner. For optimal potency, refrigerate after opening. Preparations based on one defined probiotic strain are recommended especially for people who have never had any contact with probiotics before. Multi-strain formulas may initially cause digestive discomfort and diarrhea, whereas in the case of mono-preparations the risk of this type of discomfort is negligible. In case of probiotics, the way they are stored is of great importance. After opening, you should keep them in the fridge. Also bear in mind that you cannot drink capsules with hot liquids, because they can deactivate useful bacteria and weaken the effect of the supplement.